Buckingham Palace is the most iconic royal building in the country. The London residence of Her Majesty The Queen is one of the few working royal palaces left in the world. And of course, it is guarded by regular soldiers from the British Army in their finest ceremonial dress. At Easter you can watch the Changing of the Guard and then enjoy the Spring in the two splendid royal parks. In the summer, you can book a guided tour of the state rooms (1st August – 27th September 2015 for a 2 hour tour). A short walk from Buckingham Palace takes you to The Churchill War Rooms, a reminder of the dark days of the Second World War. Here you can discover the original Cabinet War Rooms, the wartime bunker that sheltered Churchill and his government during the Blitz, where the plans were made which brought victory. The many exhibits tell the stories of those who worked underground as London was being bombed above them. Open daily from 9.30am – 6pm. Admission charges apply. The Museum is unique in its portrayal of the conflicts we have engaged in as a nation, from the First World War to the present day. Visions of War Above and Below is an exhibition (open 2nd April – 25th September) which provides a sombre view of the artistic responses to conflict, from surreal depictions of aircraft as creatures to abstract views of bombing raids and detailed drawings of life in submarines. The museum is open between 10am – 6pm and admission is free. A great battleship is an extraordinary machine, on which men and women must live and fight in confined spaces – an experience most of us would find it hard to imagine. Put yourself to the test by exploring all nine decks of HMS Belfast and see how it feels. The exhibits will help you to understand how the ship was operated and appreciate what it would have been like to set out across the oceans. Now permanently at anchor and well worth a visit. Open from 1 March to 31 October between 10am – 6pm (last admission 5pm). Admission charges apply. Founded by William the Conqueror, this powerful and enduring symbol of the Norman Conquest has been enjoyed as a royal palace, served as an armoury and for a few years in the 1830s, even housed a zoo! 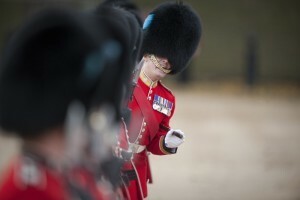 It is guarded by those most historic of soldiers, the Yeomen of the Guard and also includes the Fusilier Museum, with a display of uniforms and a fine collection of Victoria Cross medals. Open from 01 March – 31 October (summer), Tuesday – Saturday 09.00 – 17.30, Sunday – Monday 10.00 – 17.30. Admission charges apply. After many years of serving in the tea and wool trade across the globe, this 19th century ship was transferred to the Thames Nautical Training College. The military connection? It became an auxiliary cadet training ship for the Navy before finally reaching her current resting place in Greenwich. Brilliantly restored after a fire some years ago, you can explore the decks and even go below the hull to admire the copper cladding. Opening hours: 10.00–17.00, Last entry 16.00, on 3–6 April, the ship will stay open till 18.00. Admission charges apply. The world’s largest maritime museum at Greenwich presents the story of Britain and the sea, on which at times our navy has ruled the waves. Plan a visit to see discover inspirational stories of exploration and endeavour at sea, roaming through rooms packed with intriguing objects and fascinating displays. Set in a magnificent park and among other historic buildings used by the Navy, Greenwich is a day’s outing in its own right. Opening hours: 10.00–17.00 (Easter opening 28 Mar–11 April: 10.00–18.00). Admission is Free. The science and technology of guns and cannons has endless fascination. This museum presents the story of The Royal Artillery (which dates back to the Tudors!) and the role Gunners and their equipment have played in our history. A series of intriguing displays set artillery pieces with explanations of how they have changed the nature of battle and the Field of Fire video screens add dramatic sound and vision. Opening times Tue to Sat 10.00 – 17.00 (Sun and Mon closed). Admission charges apply. Why not take off to the Royal Air Force museum with its collection of over 100 aircraft to find out about the history of aviation? You will experience a 3D cinema with an awe-inspiring sound and light show of the Battle of Britain! Plus there are two flight simulators where you can try your hand at being a pilot yourself. Open 10:00 – 18:00 Monday to Sunday. Last admission 17:30. Admission is free. Rising above smoke and flames, the famous photograph of St Paul’s Cathedral during the Blitz reminds many of the values our armed forces are pledged to defend. Within its walls are the tombs of military heroes from an earlier era, The Duke of Wellington and Admiral Lord Nelson. Most recently, the Afghanistan memorial peace service was held here, attended by the Queen. Open 9.30am – 4.30pm, Monday – Saturday for sightseeing. Sundays worship only. Admission charges apply.